Provence-Alpes-Côte d'Azur is one of the most popular holiday regions in the south of France. The region covers a large area from the Mediterranean Sea up to the French Alps. Its identity as a geographical region is a hold over from the days of the Roman Empire. Its western border is the Rhône River and its eastern border is Italy. The Provence includes the French Riviera and is famous for its sunny weather, colourful countryside, tradition, wine, food, and language (Provençal). Its main attractions include the city of Avignon and the wide variety of villages which can be easily explored by car or bicycle on the networkcountry roads and highways. Van Gogh spent a respectable amount of time in Arles painting the countryside. Mostly known for the French Riviera, the Alpes Maritimes boasts 300 sunny days per year. The northern part of the region is a part of the French Alps. Vincent van Gogh was inspired by the countryside of this region. It is also home to wetlands of the Camargue, the rural landscape of the Alpilles, the picturesque village of Cassis and many other interesting destinations. Part of the French Alps, it is among the highest regions in Europe. Known for its seaside resorts, yachts, the rich and famous, Romanesque and medieval architecture and wine. An inland territory named after Fontaine-de-Vaucluse. It is particularly famous for the Luberon, picturesque villages sought after by foreign visitors for its laid-back lifestyle. Les Baux-de-Provence — An atmospheric feeling entering this little town on top of a hill, feel like you get back to the Middle-Ages. Mont Ventoux — the largest mountain in the region and has been nicknamed the "Giant of Provence" or "The Bald Mountain"
The Provence-Alpes-Côte d'Azur region covers all the historic Provence area east of the River Rhone, together with the French Riviera, the eastern end of which used to be the County of Nice. The low lying parts of this region are generally dry and warm for most of the year, but the higher parts, stretching up into the Alps, are dry and quite cool. This southern part of the Alps is the sunniest part of the range. 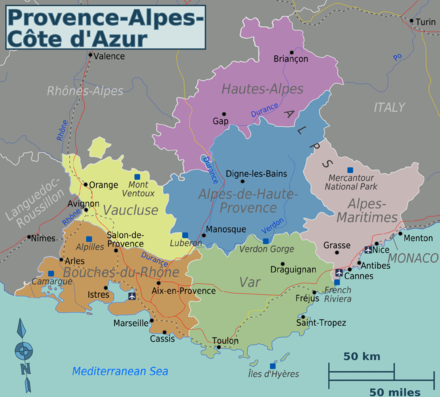 Provence is now a part of the official administrative region of Provence-Alpes-Côte d'Azur, but the region's identity is associated more closely with its history and culture. Although a bit stereotyped now (those lavender fields all over postcards and guidebooks, that you'll have a hard time finding! ), Provence culture is rooted in what was once a lively regional culture and language. Luberon mountain is a highlight of Provence, often referred as the "Chic" Mountain that rises up the valleys of Calavon in the north, to the Durance in the south. The views of this Valley are most sought after and the lifestyle of the "pays du Luberon" are an inspiration since the Roman days. All about provence], food, history, climate is unique and aspirational. Provence is a vast and beautiful region, and merits a long trip, not just a few days or a week. To truly appreciate this region you must be the type of traveler who likes food, wine and local crafts. It is recommended to make your own itinerary, and make it flexible enough to enable you linger at an outdoor cafe or winery or take in an interesting Roman ruin when the moment takes you. There is a "joie de vivre" attitude throughout this area that is contagious, especially after two glasses of the regional rose and a picnic of cheese and sausage from the local farmers. Most French cities have their own websites and tourist offices (which offer a wealth of information in many languages), allowing anyone interested the means to find what they are looking for. Those interested in literary interpretations of provincial life should look up the works of Marcel Pagnol and Peter Mayle (the latter only if wealthy British expatriates are your thing). Specifically, Mayle's "French Lessons: Adventures with Knife, Fork, and Corkscrew" also gives a bunch of practical tips and recommendations for every territory of Provence--and what every territory is best from a gourmet point of view. French is of course the official language of this region, but you'll find that many people from here have an atypical accent. The e at the end of words is often pronounced softly in Provence, where in standard French they are not pronounced at all. An example: the word "Provence" in standard French ends with an "s" sound, as "proh-VAHNSS", where in Provence itself, it will often be ended with a sound resembling a short English "eh", as "proh-VEN-seh". Many vowels are changed as well, being pronounced in a manner somewhat closer to the English pronunciation of the written vowels. Of course, standard French will be understood by the locals. This is because several generations ago, they spoke a different language - Langue d'Oc - and so learned French only in school. The dialect of Langue d'Oc spoken in Avignon was Provençal, and is the object of a strong preservation effort in the early 1900's on the part of a group of writers and artists known as the Felibrige. The most famous was Frédéri Mistral, Nobel Prize of Literature in 1908. The language has, however, now largely disappeared, though it is still taught in some regional universities and courses run by non-profit groups. Recently (around 2004) signs on the highway are printed with the village names en Français and in Provençal. Train connections from Lyon and Paris are excellent. The TGV fast train gets you there from Paris in about three hours. Typical gateway cities include Aix-en-Provence,Avignon, and Valence. From these cities, one can easily explore the beautiful region. On Saturdays in the summer season, a Eurostar service operates to Avignon direct from London (see the Eurostar website for more information ). The best way to explore is by car or bicycle. The network of country roads and highways are easily navigated. With a village every ten minutes by car, Provence is one of those places where getting lost can work to your favour. The Pont du Gard is an aqueduct in the south of France constructed by the Roman Empire to supply water to Nîmes, one of the areas key towns. But there are many Roman sites worth a visit - Vaison la Romaine and Orange for example. But don't miss one or more of the marchés hebdomadaires or weekly markets, laden with local produce and products. Visit the Lac de Saint Cassien - This beautiful Lake located just outside of Montauroux is a must visit in the warm, summer months. You can try plenty of activities on the lake including; fishing, rowing and kayaking, with rental opportunities in many places. Centuries of intense study of the culinary arts has produced a country where the food is almost invariably excellent. It is difficult to have a bad meal because the French standards are so high. But in the tourist spots there are places where the standards slip - to avoid this the classic tip is to choose busy restaurants. Each village in this region has a market day. You can buy local fare from the farms of each region (breads, cheeses, sausage, olives and preserves) and have a picnic while exploring the countryside. If you are going for a sit-down meal, you have many types of dining experiences to choose from. Restaurants are more formal in France, serving full dinner menus and at a pace that is slower than in, say, North America. You are expected to enjoy the food and it should be the main reason for going out. It is considered inappropriate to request that a dish be prepared in a different way than is stated on the menu. Restaurants usually have a selection of set menus, each with a different price range. You can also choose from a list of a la carte items. A bistrot is more casual and has more individual items. A café is even more casual, serving press coffee, drinks, sandwiches (like the ubiquitous croque monsieur) or pizzas. All wine in this region must be tasted. While all are of fine quality, a local favorite is the rosé. Unlike the sweet, cheap stuff many of us remember from the seventies, Provencale rosé is dry, light and a perfect accompaniment to an afternoon picnic of bread and cheese. As expected with such a popular tourist destination, there are plenty of different options for accommodation in Provence in addition to the hotels, ranging from renting beautiful villas, to staying in a traditional rural Gite which normally come fully furnished. There are many different holiday sites which offer good quality accommodation in the region, particularly in the most popular months; May-September, when the weather is at its best. If you decide the Provence is your place to stay, you might as well stay safe. The last 10 years have seen a sharp rise in the crime rate on Côte d'Azur, with many houses burgled and people having their belongings stolen. Help and information for victims of burglary and those who want to check or improve the security of their property is best done with the local police chief. If you decide to make the Provence your base and you are looking to buy a property, you also need to be safe. Don't just buy your property without doing the necessary research. Make sure you buy your property through a listed agent who is in possession of a 'permit". In recent years, Marseille has gained a reputation as one of France's most dangerous cities, while cities like Nice have seen their fair share of crime growth. Monaco is a sovereign country completely surrounded by the Provence-Alpes-Côte d'Azur. It can easily be visited as a day trip.